The United States Military Academy's mission is to educate, train and inspire the Corps of Cadets so that each graduate is a commissioned leader of character committed to the values of Duty, Honor, Country and prepared for a career of professional excellence and service to the nation as an officer in the United States Army.The Academy provides a superb four-year education, which focuses on the leader development of cadets in the academic, military, and physical domains, all underwritten by adherence to a code of honor. Congratulations to your Cadet on their Graduation! GO ARMY - BEAT NAVY! Secretary of Defense, James Mattis. Commencement speech to the class of 2017. Check out our locations via the links below. For more information or to inquire about booking, please call +1 (845)938-8811. Graduation Week: (seven nights) Sunday night - Saturday night. Reception Day Weekend: (four nights) Friday night - Monday night. All vehicles, including RVs, towed/trailered cars, trucks or motorcycles, must be registered through the Directorate of Family and Morale, Welfare, and Recreation (DFMWR), Outdoor Recreation office. Registrations may be accomplished beginning the Tuesday after Martin Luther King Day between the hours of 12pm and 4pm (Eastern Time) via telephone +1 (845)938-8811 or in person from 9am to 5pm daily beginning April 1st at Round Pond Recreation Area. Payments may be made by credit card if telephonically, or cash, check or credit card if in person. RVs who have pre-registered and payment received may enter West Point through the Stony Lonesome Gate and proceed directly to North Dock. RVs/vehicles found not registered will be subject to ticketing and removal at the owner’s expense by the Military Police. Please note: RV North Dock sites accommodations are for one RV and one POV only. Space cannot be reserved for tailgating/parties. Please see Private Graduation Party Locations tab below. Reservations made in advance (Jan 22nd – May 18th ) $65 per night, 3 night minimum stay. Utilize either the dump station at the Waste Treatment facility at Target Hill Field or at Round Pond ONLY to dispose of grey or black water. Utilize the water hose at the maintenance facility at Shea Stadium to fill holding tank with potable water. Police all trash and discarded items in local dumpsters. Leash pets and clean up behind at all times. In the event of an emergency, call the West Point Military Police at +1 (845)938- 3333. Any other questions or concerns, please contact the Round Pond Outdoor Recreation office at +1 (845)938-2503. USMA Parent IDs: Complete and hand carry this form to West Point is you are in need of a parent ID. For questions, please call +1 (845)938-8826. Get on US-9W headed South. Follow US-9W S to Main St in Fort Montgomery. Take the exit toward Highland Falls/W Point from US-9W S.
Follow Main St and W Point Hwy to Thayer Rd. Head northwest on Palisades Interstate Pkwy N.
Continue onto US-6 E/Palisades Interstate Pkwy N.
At the traffic circle, take the 3rd exit onto US-9W N/Rte 9W. Take Main St to Thayer Rd. Head southwest on NY-9D S toward Meadow Ln. Continue onto US-202 W/US-6 W (pay partial toll). At the traffic circle, take the 1st exit onto US-9W N/Rte 9W. Continue to Woodbury. Take exit 130A from US-6 E.
Get on US-6 E in Highlands. Merge onto US-6 E.
Continue on US-9W N/Rte 9W. Take Main St to Thayer Rd. Buffalo Soldier Field / 22 sites available / located adjacent to the Thayer Gate. South Dock / 15 sites available / located on the Hudson River, below Central Area. Daly Field / 7 sites available / located adjacent to Trophy Point. Round Pond / Pavilions: call +1 (845)938-2503 for more information. Reservations will be available online only begining January 22 at noon. All packages include delivery, setup, and pickup! On-premise site-fee, Buffalo soldier Field:$125; South Dock: $125; Daly Field: $150. 125 and 150 person plan is available by phone only. +1 (845)938-8811. Additional items such as Baby Back Ribs, Brisket and Cornbread are available. We will be happy to deliver and set up for you: a 20% fee will be added to your bill. Please inform us of any special dietary needs (vegetarian, vegan, gluten, nuts etc) upon booking. We will do our best to accommodate your party. Please call +1 (845)938-2140 to book your event today! All catering must be booked and fully purchased two weeks in advance. There is a 48 hour cancellation policy - at which time, 50% of your payment shall be returned to you. All packages include plates, napkins and utensils. The West Point Golf Course Food and Beverage Operation makes a great lunch! Simple and perfect for nice picnic with friends and family. Our items are prepared fresh and always hand made. Choose three of our Hand Made Wraps: Ham & Swiss, Turkey & Cheddar, Roast Beef & Cheddar, Chicken Caesar, Chicken Bacon Ranch, Tuna Salad. Served with assorted cookies or brownies. Packages include all condiments, plates, ware, and napkins. Catering is pick-up only. Call Mr. Craig Arms at +1 (845)891-9823 to place your order, today! If you are looking for West Point items during your visit, items are available at a few specialty locations. Custom framing, engraving, and gifts can be ordered through the West Point Arts & Crafts Center. Contact them today to have special items ready when you arrive! The Cadet Book Store carries gifts including clothing, shoes, jewelry and a variety of other items with the West Point and class insignias. We offer top name brands, such as Calvin Klein, Dooney and Bourke, Timberland, Kenneth Cole, and Under Armour. Clothing purchased at the Cadet Store can be fitted and altered so that the wearer can look their best at all times. West Point Exchange also has commemorative kiosks and an West Point Athletics store for West Point items and gifts. 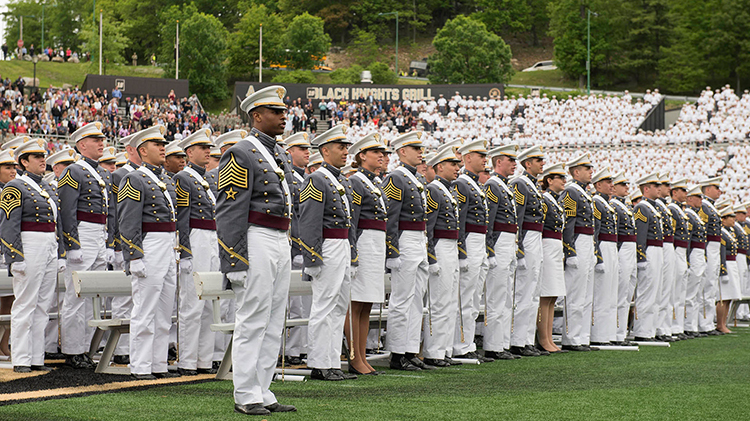 We at West Point Family & MWR have a myriad of activities families to enjoy during Graduation. We hope you'll take time to visit our facilities to make your stay more enjoyable. We want to do our best to insure your Graduation experience is the best it can be. We will respond to you as soon as possible. Please consider speaking with your Cadet as they may have the information you seek. If your inquiry is regarding Catering or On-site Parties, please contact the corresponding activity directly. Or see the corresponding sections above. Thank you. For additional information, check out the West Point Parents Information website.